Trying to find Southport recently, Seco Development’s hotel-office-apartment complex at the south end of the lake in Renton, I first turned into Boeing’s plant next door to the west. It would’ve been easier by boat. This was both amusing and frustrating, since I’ve bicycled past the 17-acre site hundreds of times over the years, but never visited. The 383-unit Bristol apartments opened in 2002 and 2008. Last summer, the 12-story, 347-room Hyatt Regency was added, and now the first two of three nine-story office towers have topped out. The 383-unit Bristol apartments debuted in two phases, in 2002 and 2008. Last summer marked the opening of the 12-story, 347-room Hyatt Regency. And now the first two of three nine-story office towers have topped out, which occasioned my recent visit. But where were they? Finally I spotted a small entrance sign and parked in the mostly empty garage, which serves the hotel and offices. Southport, which will cost a reported $590 million, is an EB-5 project. There’s an investment office for the Seattle Family Regional Center on the site. The project has its origins in 1999, when Michael Christ’s Seco — then primarily an Eastside apartment developer — bought the Shuffleton steam plant from Puget Sound Energy for $7 million. Legend has it that Christ first spotted the site from his boat. On the empty top floor of tower one, I joined the crew from Exxel Pacific as they were enjoying lunch catered by Jack’s BBQ. Also on hand were representatives from the design/build team: ZGF Architects, Hewitt Architects, Coughlin Porter Lundeen, Glumac and Hart Crowser. Leasing agent CBRE is new to the team, after replacing JLL earlier this year. Dwight Newell, Scotta Ashcraft and Nick Carkonen are leading the CBRE effort. There will be 688,147 square feet in the three office towers. Towers one and two should be completed late this year; tower three (to the east) will be finished next year. Towers one and two will have large floor plates — up to 35,000 square feet on the upper levels. Tower three will be a little smaller. Spencer says there’s interest from both in- and out-of-state companies. The latter might be drawn by cheaper employee housing — the median home price in Renton or the Maple Valley is a fraction of, say, San Jose. The 2,121-stall garage totals 695,159 square feet, bringing the entire project size to about 1.4 million square feet. Add the hotel and apartments, and you get about 2.4 million square feet. Oh, and the garage has 194 bike stalls and an area for kayaks, too. 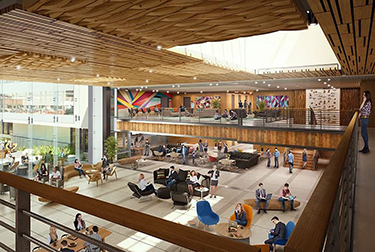 One Exxel Pacific executive noted that, in terms of concrete and other materials, this office project is comparable to a 40-story high rise. City officials marvel at the transformation, and say it’s a game-changer for the city. It’s also a whole lot of speculative office space. Cushman & Wakefield recently put the Renton office vacancy rate at 22.6 percent. It also recently arranged a $265 million construction loan for the Southport offices, refinanced the Hyatt and recapitalized the Bristol apartments. The first two office buildings should be completed late this year, and the third building will be finished next year. And he says Seco’s long-range plan is to buy another contiguous chunk of land from PSE, about 10 acres to the south, and construct a large Class A office building or buildings. ZGF is already working on that plan. No timeline has been set, but Spencer says it’s part of CBRE’s marketing push — i.e., if you like the first three towers, we could build you more. 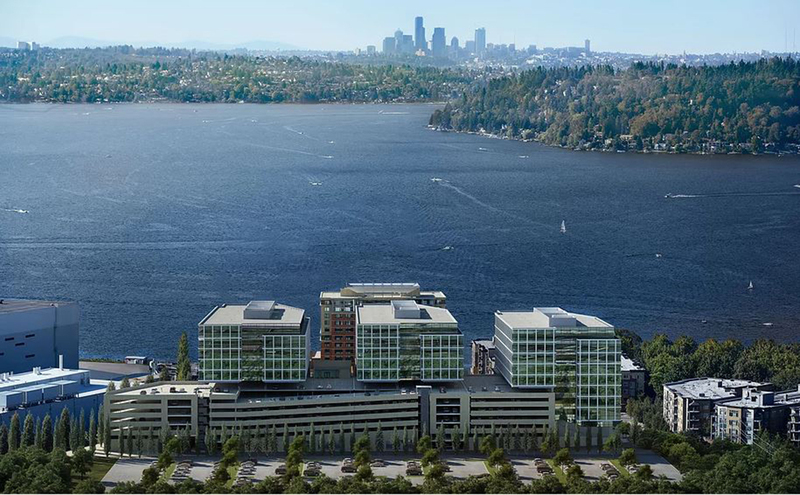 Renton zoning, farther from the waterfront, would allow them to be twice as tall — up to 18 stories. CBRE’s brochure says that expansion could add over 4 million square feet. Plans are also afoot to extend what’s now Park Avenue North into the Southport campus — creating a more prominent and easy-to-find formal entrance. The city is also contemplating a new Southport branch transit center, which also might further entice tenants. Then there’s the Eastside Rail Corridor Trail (aka the ERC Trail), which runs right past Southport. It is being completed in stages, and will eventually run 42 miles from Renton to Snohomish — another lure to cycle commuters and lunchtime joggers. Spencer says there’s a preliminary plan for adding a Southport water taxi in 2020. The water taxi is projected to take 50 minutes to reach South Lake Union — quite possibly faster than driving, at least during rush hour. Future stops might be added in Kirkland, Bellevue and Husky Stadium, near the light rail station. Or would you prefer to commute on your own boat? “We’re gonna be adding moorage,” says Spencer, meaning about two dozen short-term slips in front of the hotel, not a commercial marina. Facing the water, a Black Rooster restaurant will open this summer in the hotel, with outdoor dining. More restaurants, pop-ups and cafes will eventually fill the 30,000 square feet of retail. Seco estimates that Southport will eventually serve about 9,000 workers, hotel guests and apartment dwellers. 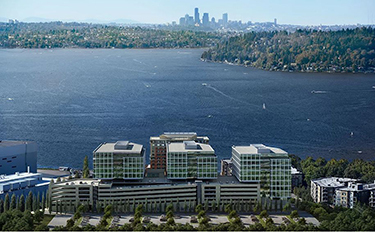 A stone’s throw to the south is The Landing, developed in 2008 on 68 acres formerly owned by Boeing, with 600,000 square feet of retail and some 900 apartments. And, besides the PSE land that Seco intends to purchase, there are many undeveloped parking lots and parcels nearby that are owned by Boeing and Paccar. A decade ago, Boeing had 250 acres, though some buildings and land have been sold since then. Renton has plenty of room to grow, and the city recently approved a Downtown Civic Core Vision and Action Plan, meant to help revitalize the area. Before selling the 17 acres, PSE did soil cleanup for the plant that operated from 1929-1989, powered by wood waste and oil. The plant was demolished in 2001. Southport’s neighbors include the 22-acre Quendall Terminals property, a former creosote plant and Superfund site, now being marketed by Century Pacific; the Seahawks‘ training facility; and the former Barbee Mill site, with 114 homes developed by Connor Homes. And from there, of course, it’d be a very short kayak commute to Southport.